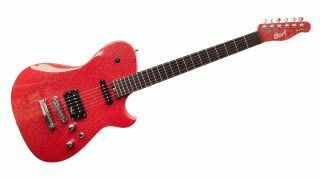 NAMM 2016: Manson Guitar Works has revealed a new Red Sparkle finish option for its popular Matt Bellamy signature model, the MBC-1, and announced a left-handed version is also in the works. The Muse man's first affordable signature model received rave reviews when it was rolled out last February and, at £500, represented excellent value for money. These expanded options are only good news, especially for oft-overlooked lefties. Check out our full review of the Manson/Cort MBC-1 and read Manson's press release about the new options below. PRESS RELEASE: Following the success of the Manson/Cort Matthew Bellamy Signature Guitar released in 2015, Manson Guitar Works are pleased to announce two new options for the MBC-1 model. The new MBC-1L Matthew Bellamy Signature is the left-handed version of the existing MBC-1. The MBC-1L offers left hand players the opportunity to start playing the multi-award winning MBC-1 guitar with all the features of the current model, but in left- hand format. In addition a new colour, Red Sparkle, will sit alongside the existing Matt Black MBC-1. Both will have all the features of the existing 2015 model that have made it a huge success to date. The MBC-1 has been the recipient of many awards across the globe in 2015 including the MIA 'Electric Guitar Of The Year Award', Total Guitar 'Best Buy' (5/5) and Guitarist Magazine 'Gear Of The Year Award 2015'. The MBC-1RS - Red Sparkle - is a vibrant and stunning holoflake finish over the exact same red base coat used by Hugh Manson on the legendary Manson Matthew Bellamy MB-1 "Santa" model. Like the MBC-1L, the Red Sparkle model will have all the great specification of the Matt Black version: custom Manson humbucker design, kill button, sleek neck profile, locking machineheads and vintage neck pickup design. Release dates and final UK prices are to be confirmed.